In Florence, dearest Mildred, do call up my Greek friend, Anna Levi.Anna Cosadino (Kosadinou) Levi (1895–1981), wife of the art historian and archaeologist Teodoro (“Doro”) Davide Levi (1899–1991). She was born in the Greek section of Istanbul and married Levi in 1928. See Giovanna Bandini, Lettere dall’egeo: Archeologhe italiane tra 1900 e 1950 (Florence: Giunti, 2003), 92n29 and 122n3. Her husbandTeodoro (“Doro”) Davide Levi (1899–1991), an Italian art historian and archaeologist. is a very distinguished archaeologist, Univ. professor, who has done a lot of digging in Crete, Mesopotamia etc etc. She was Anna Cosadino, of the family (orig. Gozzadini from Bologna) who were Lords of Keos (one of the Cyclades) from the 13th cent, until the Greek Independence. She has a marvellous eye for a work of art, and is a person of great distinction in all sorts of ways. They live 18 via Andrea da Castagno, Tel. 51234. I’ve written them that you may call up. She would show you the sort of things we like in the Bargello, the Opera del Duomo, the Laurenziana. She speaks excellent English. In Rome, you’ll want to spend some time in the Vatican—Museo Cristiano, and I enclose a card for Volbach, ex-Kaiser Friedrich Mus., now with H. H. Pope.Pope Pius XI (1857–1939), the head of the Catholic Church between 1922 and 1939. He speaks, more or less, French, and a lot of it. In Rome, I think you should spend some hours looking at the great brick buildings, ruins most of them, of the IIe –IIIe–IVe centuries, for it was out of them that came Santa Sophia. The baths of Caracalla, the so-called Minerva Medica (by the railway track, about 2 kilom. outside the Termini station, on the R. hand side leaving the station) and the Basilica of Constantine in the Forum. Of course you must also see the Mosaics of Sta. Maria Maggiore, SS. Cosme and Damiano, Sta. Pudenziana, The Lateran Baptistry, Sta. Prassède—and, among the IXe Cent. Roman mosaics—a poor lot on the whole—Sta. Maria in Navicella (or in Domnica). 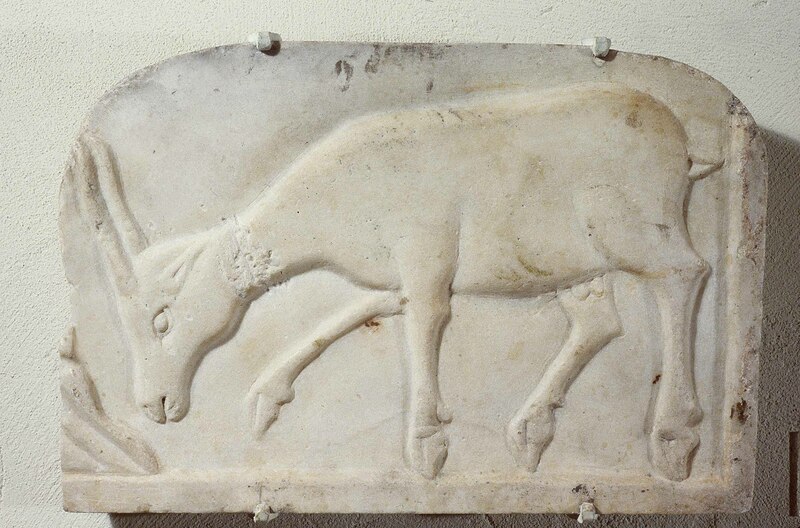 Among the museums, don’t miss the little Museo Barracco, where there is A 1 Greek sculpture, and some Byz. slabs allied to the one you gotBZ.1936.44. at Stora’s. Stora sent me photos of 2 heads,These sculptures have not been identified. They may be two marble busts from the Sambon Collection, Paris, that were exhibited in the Byzantine Exhibition of 1931, nos. 521 and 528. which he calls Byz. and which got into the Byz. show one day when I wasn’t there. I was glad to hear from his letter that you don’t like them. Nor do I.
I send back the SphinxThis sphinx has not been identified. photos. It’s an interesting object, but I don’t think I should be tempted.